We provide a wide range of panels/Prefabricated Houses which is widely used in making of the Cottages in farm house, lawn or a shack on sea shore. These panels provide quick and easy to install construction option without the involvement of any bricks concrete. Apart from that, they also saves time and provides a new way of living in style. We provide Prefabricated Houses which are make shift arrangements for the calamity victims and provide them with a proper house. These prefab houses are made up of best quality ply and other material and can withstand stormy conditions as well. As a distinguished organization, we are instrumental in presenting a wide assortment of PrefabricatedLabor Camp. Our offered range is precisely designed by the team of expert engineers and hard-working members of our company. Sloping-roof house (Modular) is a completely new-concept, eco-friendly, economical prefabricated mobile house. It is built on a lightweight steel skeleton surrounded by protective color-coated steel sandwich panels, can be simply and easily assembled in modules, with the components screwed together, and can be quickly assembled and dismantled. 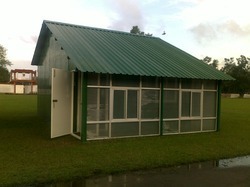 FRP Shelters - FRP puf insulated prefabricated shelters. Self supporting structures, does not require any supporting frame work and can be easily assembled at site using nuts and bolts. Easily relocatable, practically maintenance proof. We offer premium quality ready to move in Portable Homes that are available in various shapes and sizes according to customer need and requirements. It has a huge market in the near future where people are ditching traditional houses for more efficient ones. 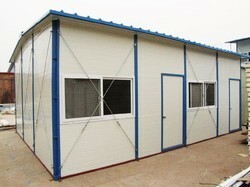 Banking on our enriched industry experience, we are able to supply Prefabricated Houses.